I have an MSA 72 griddle where the pilot won't stay lit, looks like a traditional thermopile type safety valve but I don't recognize this type of thermocouple and I have no idea how it works. The 2 other pilot valves run just fine, this one you light and the moment you let go of the safety button or the pilot lighting button or whatever its called, it dies. I have the top propped up right now and the front cover is off, any immediate help would be much appreciated. Olivero, that is not a thermocpile. 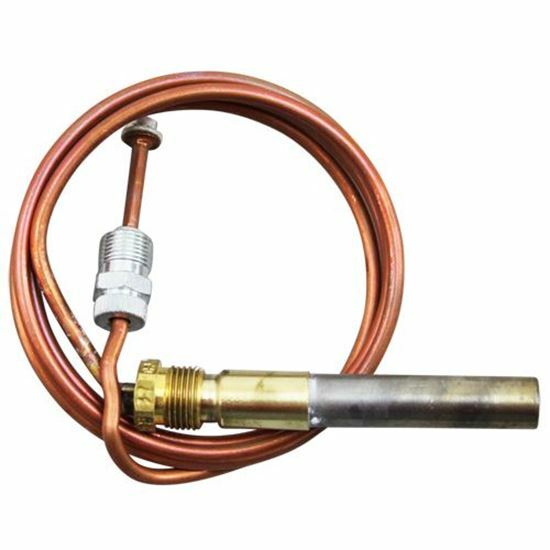 It is a thermocouple. The difference is that a thremocouple is a single bond that will make 50 millivolts, were as a thermopile is multiple thermocoulples and generate 750 milivolts. It has 15 thermocouples welded in sieries. Now this is where you use your DVOM to test the output and continuity of the system. Understand that when the curciut is closed to energise the coil in the gas valve the voltage drops. With a thermopile, it is flexable and will drop to roughly 450 millivolts at the valve. 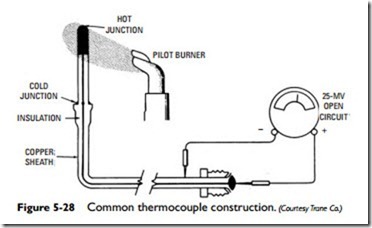 However thermocouples are more sensitive to correct pilot flame. Measure the coil resistance to be sure you have continuity and the thermocouple that it is making correct voltage open. They commonly have high resistance where the tube connects to the valve The leaded center gets oxidized and the tube outer as well. They have to be clean and free of foreign materialand oxidation. Be aware that a good pilot flame is VERY important. Blast the pilot out with a strong shot of nitrogen before doing anything. The air into the pilot (and main burners) is a vacuum cleaner of greasy air, so it will foul over time. If you don't have the thermocouple adapter, it's not unusual. It can be easily be replicated for future use with a simple part from HD or Lowe's. If you don't have or a place to purchase one, (sorry fixbear) for expedience sake - just simply install a new thermocouple in there. I know it's a PITA to get to, but with some experience, it gets easier. If you want instructions on replicating that adapter, let me know. That BASO pilot safety valve (PSV) requires 3mV minimum to remain shut. If you're sure the thermocouple isn't the problem, then a new PSV will be needed. That's not unusual. As a practical matter, I always install a new thermocouple with a new PSV anyway. They're cheap, but DO use one from Vulcan instead the junk from a big box store. I'm so pleased to have an actual technician asking for help here instead of the usual cra...uh - stuff. Your not alone on that. This question makes me wonder what size wire is used in the BASO valves. Years ago I tried to wind a new coil for my 1955 GE 450 amp gas drive welder. GE did provide the specs on the coil because they no longer supported it and had gone out of the welder business in the sixties. First problem was even finding 48 gauge wire in a long enough roll to make the coil. Then discovering the impossibility of hand winding that fine of a wire without breaking it. Not possible! Had to ship the clean armature to a company in New Jersey. But I'm getting off track here. Has anyone tore apart the valve and determined what gauge wire it has to only need 50 MV to hold in the valve. Granted, there is no pull in force needed, just a light holding force. And I've never measured how much amperage a BASO valve draws. But it sure has to be minuscule. I find it very awesome how you guys take these types of conversations and escalate them to NASA technical status, lol. Turned out to just be the thermocouple, changed it out and it worked. Found one we had on hand for something else. Apparently this is one of the oldest types of flame monitoring there is, yet I've never encountered it until now. I thought it was some type of pressurized bulb or something going into the valve. It's been around for as long as I can remember. And I started working in the fifties. It's accually called a coaxial themocouple. Years ago before they started using Teflon for the insulation of the wire we would lose them often from shorting due to expansion and contraction. But today's are really good comparatively. They also make a woven glass heat insulator to go over the tube to protect the internal insulation. Makes sense, I called in one of our more experienced techs and when he saw it, he laughed at me because I told him, "I've never seen this before, I don't know how it works" and he told me the same thing, it's been around forever. So how exactly do they work? He said they are not salvageable, not like a flame rod where you can sometimes get away with just cleaning them, apparently this one is dead when its dead. Is it just 2 dissimilar metals? That's a tiny excerpt from an old training manual I have from the military. The thermocouple uses HEAT to generate an EMF (electromotive force), which is explained on the page labelled 1-29 (page 2 in the PDF). FWIW: That's also the same concept which some temperature probes operate from. Mainly type K (like your digital VOM uses) and type J thermocouples, which are used for some electronic temp controls. Obviously the thermocouples used to sense a flame and ones used to read a temperature are quite different. The other two types of electronic temperature probes in common use are RTDs (resistance-temperature detectors) and thermistors. Both of those work from a relationship between temperature creating a resultant resistance. 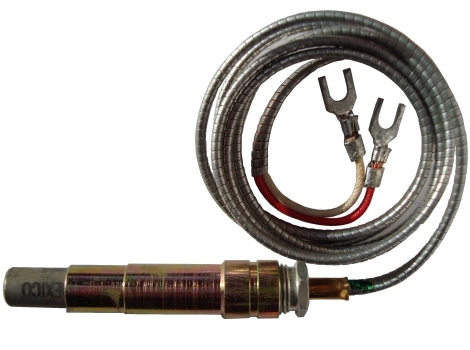 Coaxial flame sensing thermocouples have come very long way as manufacturing technology has improved. I remember the cap tube on them used to be about 3/16 diameter. And since they didn't have the heat conductive compounds of today they would take almost a minute to generate enough power to hold in the safety. My hot water heater only takes about 5 seconds. Most failures come from internal shorts and weld failure at the bond. Also they do still have iron as a wire in some, but that being so brittle is has become unfavorable to high end ones Tight radius of the coaxial tube with high heat variation like under a griddle causes a lot of movement inside. This in turn makes wear at a short. So, the only way to test them is not with a ohm meter, but to apply heat and measure voltage. There is a sharp-ish turn for the probe in the flame when it turns up to its mounting bracket, I don't know where the old one failed, I still have it and perhaps I can figure something out with it. I guess the difference with flame rectification is that it's in essence grounding a signal voltage generated from something else whereas the thermocouple is generating its own "signal voltage" by the 2 dissimilar metals rubbing together and being in contact with eachother. It's interesting how all this stuff came to be. Your issue back THEN was with a full-fledged millivolt system in a fryer. A thermocouple circuit is simply a greatly simplified version of a millivolt system. The differences? - Is comprised of a single hot junction. - Has a standard no-load output of 30mV. - Always used to power just a pilot safety valve (PSV), such as a TS11 or BASO. - Is comprised of twenty-six junctions in series (30mV x 26 = 780mV). - Has a standard no-load output of 750-780mV. 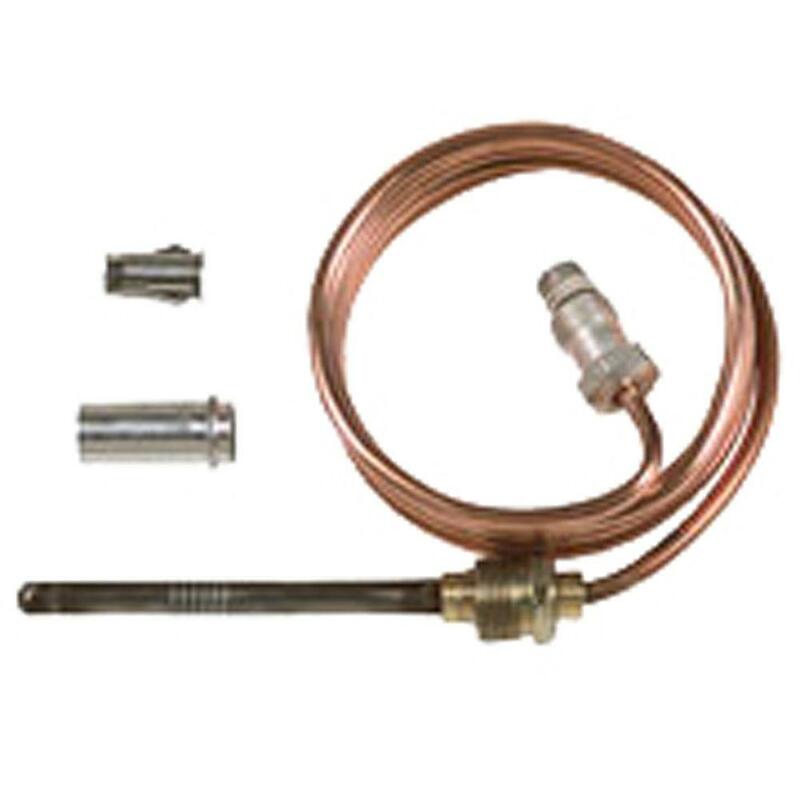 - Uses a coaxial-type connection similar to a thermocouple, but intentionally sized differently. - Used with a combination valve and often (but not always) serves as the only power source to operate the pilot AND main valves - while generally employed to do so through control components such as a thermostat and a high-limit. Beings that there's more circuitry, a thermopile generates more voltage to "punch" through the additional components and the multiple connections required. - A PG works the same way as thermopile. The primary difference is a PG (PP) has two lug connectors instead of a coaxial connector. - The one pictured <<<there is an armored style PG (PP), designed specifically for higher temperature applications...such as in pizza deck ovens. FYI: The two dissimilar metal in a thermopile DO NOT rub together. They simply work due to properly applied heat to the HOT junction (immersed in the pilot flame) and the resultant difference in temperature between the HOT junction and the COLD junction. That difference in temperature generates a current flow. Just to clarify, the COLD junction isn't actually a junction at all. That term just refers to where voltage output can be derived due to the difference in temperature between the two points. The operation of a thermocouple (or thermopile) is dependent on the quality of the pilot flame, so it's important to address flame quality issues during your troubleshooting. Like fixbear said, the only proper way to test a thermocouple (or thermopile) is with a DC voltmeter. Additionally, testing of each should generally be under a load. I say that because they can often still be capable of producing an output, but have gotten weak over time. Although, as an initial assessment - you can certainly go ahead and test them with NO LOAD. I've done that too - and found a few that had outright FAILED to produce ANY output. When dealing with systems using electronic flame controls with a flame sensing electrode, you can certainly buy some time by simply polishing the flame sensor rod. These systems operate from "flame rectification". For thermocouples (and thermopiles)...it's not the same. THOSE two components DO NOT function due to the theory of flame rectification. They function simply by a flame impinging on the tip so the device came generate its OWN voltage. Those two systems aren't even REMOTELY similar. As ectofix say's thermocouple voltages have dropped over the years from the originals. That's because they now use (chromel-alumel) bonds instead of the old copper-iron. Also why they are more reliable. The real trick is the heat conductive compound has to also be a electrical insulator. Total opposites. On a side, there are a lot of thermopiles around you every day. Your doctors IR thermometor is one. Haha, I think its great how between the 2 of you, there's nothing unsolved in the kitchen. Thank you as well for helping me fix this, I also appreciate the learning, I hate fixing something without knowing how it works. I find it very awesome how you guys take these types of conversations and escalate them to NASA technical status. Wow, well that makes a whole lot of sense. Thank you for going through the efforts of posting all that and explaining it to me. My downfall is on some of the original stuff as I wasn't around during that time and I am limited to working on mostly the same stuff repetitively, but i am planning on attending a gas and electronic ignition controls class here a month or 2 from now which should be very awesome and hopefully help me understand all the other stuff that's out there as well. When I saw this thermocouple I honestly thought it was a capillary tube with gas in it and it was some sort of safety for the thermostat or something of the sort. Thank you for helping me with this problem.